We know it’s only June and there’s (some) summer sun to bask in for a few months yet before Autumn comes to say hello, but we’re a little too excited not to mention our upcoming adventure to the Takeaway Expo 2016. September’s not quite around the corner but we’re gearing up for two days of networking, meeting new customers and, let’s face it, more than a handful of free food samples! The expo takes over a spot in London’s Excel on the 27th and 28th of September and with UK adults spending as much as £110 a month on fast food according to Daily Mail findings, there’s always a great buzz amongst exhibitors. 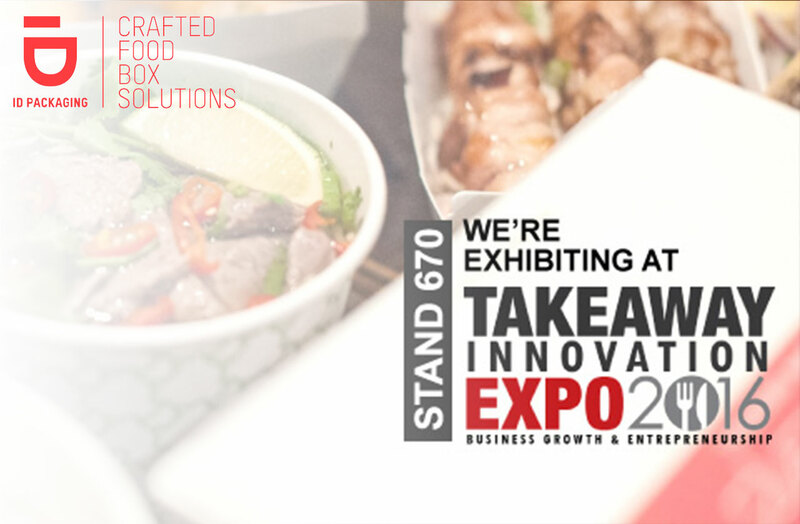 ID Packaging are going to be taking up residence at stand 670 and we’d love to see new and old faces alike to shoot the breeze or, you know, just have some majorly geeky chats about takeout trays. With our serious faces on though, the Takeaway Expo is an opportunity to put faces to names and discuss your exact requirements with the team. So much business is completed remotely nowadays with online booking forms, automated PO systems and the ever-present ruler of all the land that is email. It can be difficult to feel like you’re getting a personal service and that’s why it’s important for ID Packaging staff to get out and about to meet new and existing customers. We know that there are small take out businesses looking for simple, cost-effective solutions to their container needs and that minimum orders of 20,000 and more just won’t cut it. At this year’s expo we’ll be on hand to tell you about our low minimum order of 12,000 which you can even mix and match with up to the three designs. All orders are custom printed with food safe dyes because even that one kid in secondary school who always seemed to chew their pen till it burst in spectacular fashion never really got a taste for biro ink. We’re big on organic materials too so if you’re a fellow planet-saver then come check us out. Whether you’re looking to place an immediate order, have a chat about how our packaging can best work for your business or even if you want to discuss the weather we’ve been having (we’re in Britain, it’s practically law that the weather features at least once in every conversation), then head on over to stand 670 at the Takeaway Expo 2016 – if you’ve managed to get your hands on any extra special foodie freebies then you’re doubly welcome!